The music teacher lived on Rodrigo Road, Kilbirnie. Her name was Kristen. She told Netty to buzz like a bee. Then she told her to pucker her lips and spit without spitting. Then she told her to do raspberries. She handed her the mouth piece. Buzz, Netty went. Honk. Honk. Buzz. Beep. The teacher put the mouthpiece back in the instrument. Netty made small spitting noises into the end of it. The trumpet honked. She kept doing the spit-blow and quite quickly a smoother sound erupted. A note? “What did you do differently just then?” Kristen asked. Netty stared at her, unsure how to answer. “A trumpet’s not like a piano you know,” the teacher said. “I can’t see what you are doing when you play the trumpet. You have to feel what is happening from the inside. You have to be your own teacher.” Her remark mirrored something a teacher had said to me. I turned my head away to hide my tears. There was a trampoline outside on the grass and some silverbeet gone to seed. I was standing at the barre in the West End Scout Hall. I was in fifth position. My ballet teacher Val Deakin was talking. “We don’t have any mirrors here,” she said. “You don’t need to look to see a position is correct. You need to feel it is correct from the inside.” We all went to Rodrigo Road every Wednesday afternoon. My other two watched television and I watched the lesson. Netty was only seven then, too small for a trumpet, so we rented a cornet instead. Our neighbour was a musician. One day, the younger two were playing out the front and Jon yelled over the fence. “Hey, which one of you plays the cornet?” “Me. I do,” Netty said. “You’re sounding better!” One Wednesday a man answered the door at Rodrigo Road. “Kristen’s been held up at work,” the man said. “But I can take the lesson until she gets back.” Peter was bossier than his wife. “Keep blowing,” he said to Netty. “Come on, you can blow harder than that!” Netty’s face was bright red but she kept on playing, up and down the scales, hitting notes that had not been reached before and achieving a pleasing clarity as well. The half hour was almost up when Kristen burst in. She was also red in the face from running up all their steps. “I’m here,” she said. “Peter has done really well,” I said in my most patronising voice. “He’s been a good fill in.” “And did Peter say what he does?” Kristen asked. “No.” “He’s the second French horn player in the New Zealand Symphony!” We left Wellington and returned to Melbourne. Kristen gave Netty a white linen hanky with a yellow trumpet embroidered on one corner. Blow here, it advises. Netty is still playing. Last year, she joined the Hyde Street Youth Band in Footscray. Motto: “Sounding great since ’28.” They say it’s the oldest youth brass band in the Southern Hemisphere, a claim worth repeating. Netty is in the third cornets with the occasional foray into the seconds. I am still watching, still learning. Last weekend, the band went to Sydney to compete in the Australian National Band Championships. I was one of the roadies. Our major test occurred on Good Friday night when we had to clean all the instruments so they would be sparkling for the Parade of Bands the next day in Hyde Park. 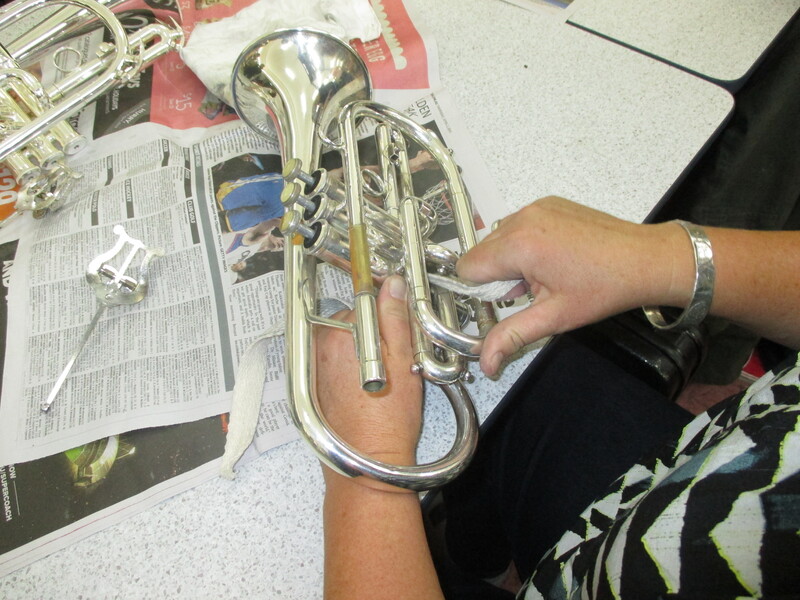 Do you have any idea how many parts of a bloody cornet can get tarnished? 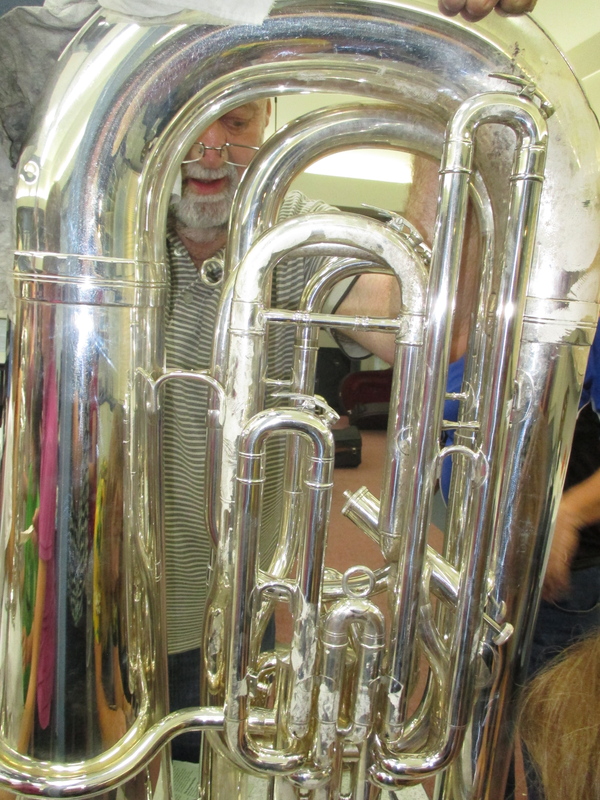 Three roadies worked on the tuba for an hour. I am not exaggerating. Here’s a photo of the president hard at work. In the end, it rained all night and the parade was cancelled but the band still got to play in the Junior C Grade Brass that afternoon. They also competed in the Open D Grade Brass with the adults. Brilliant stuff kids, brilliant conducting Murray Walker! I thought Hyde Street’s stand out piece in both grades was the “stage march” – Wilton Roach’s Victorian Rifles – but we’ve all got a bit of work to do before we can match Australia’s only youth A-grade band, the stupendous Gunnedah Shire Band. Their “own choice” piece, Philip Sparke’s subtle yet majestic Hymn of the Highlands (movements 1 & 3), made me cry. It was absolutely brilliant to watch those expert young musicians and their conductor, Dwayne Bloomfield, throw themselves into the music. Was it just their technical skill that made the Gunnedah instruments appear so polished or is there some secret taping technique or cleaning substance that we don’t yet know about? This entry was posted in Uncategorized and tagged brass bands, cornet, Gunnedah, Gunnedah Shire Band, Hyde Street Youth Band, Kilbirnie, Lyall Bay, Melbourne, National Brass Band Championships, New Zealand Symphony Orchestra, Rodrigo Road, teachers, trumpet, Val Deakin, Wellington. Bookmark the permalink.